Welcome fans of the pride of South Bend. I am a long-time Studebaker fan and Studebaker Driver's Club member, having owned a 57 Silver Hawk in high school and a 59 Lark Regal Hardtop in college. Since then, I have owned other Studes as hobby cars including a 62 Champ Pickup, a 64 Canadian Commander Special, a 62 GT Hawk, a 60 Lark Regal 4-door, and my present 57 Silver Hawk (not the same one I owned in high school -- that one I wrecked). If you have any suggestions or comments, please send me a message. Both text and image contributions are welcome. The 1953 Studebaker Starliner Hardtop and similiar Starlight Coupe were radical departures from the comparable 1952 models. Both were long and low with little chrome trim. Although commonly referred to as "Loewy Coupes" they were designed by Robert Bourke who headed the Loewy team that worked for Studebaker. These cars won numerous styling awards but they also experienced early production problems. Although plagued by rust, quite a few have survived given the excellence of their design. Body repair panels and fiberglass front fenders are available for restoration purposes. 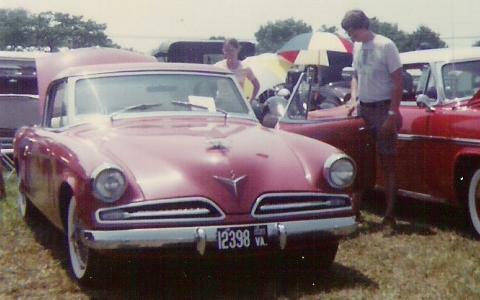 The Champion Starliner Hardtop in the picture above has the three-point hood emblem that was changed after Mercedes-Benz objected to its use. Champions used Studebaker's 170 cubic inch flathead six rated at 85 horsepower. As such, they worked best when equipped with a manual transmission and overdrive. Commanders on the other hand used a 232 cubic inch V8 rated at 120 horsepower and were thus a better choice with automatic transmission. Otherwise the Champion and Commander versions appear virtually identical. 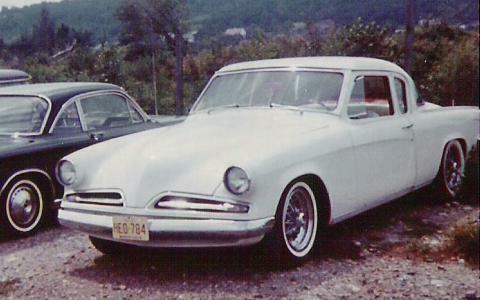 This picture of a mildly customized 1953 Studebaker Starlight Coupe was taken in the parking lot of Island Dragway near Great Meadows, New Jersey a number of years ago. The hood emblem has been removed and headlight rings from a late model GT Hawk have been installed in place of the stock rings. Other than these changes and updated wheels and tires, it appears to be basically stock. The center post and small push out rear windows easily identify this as a Starlight Coupe. It could be either a Champion or a Commander but that can't be determined from this picture. By 1955 the Loewy Coupe had been modified with additional trim, heavier front and rear bumpers, and a large chrome grille. The bright band across the roof and the fog lights on the front bumper indicate that this is a President Speedster. The Speedster used a 259 cubic inch V8 rated at 185 horsepower so it had considerably more power than the earlier Loewy Coupes. 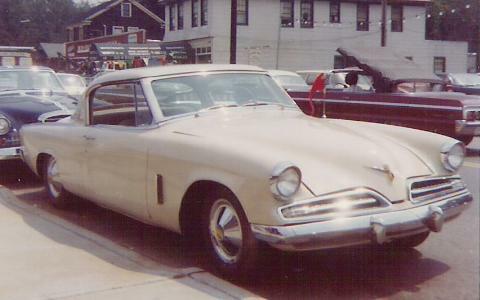 The design was changed again in 1956 when the Loewy Coupe was transformed into the Studebaker Hawk. 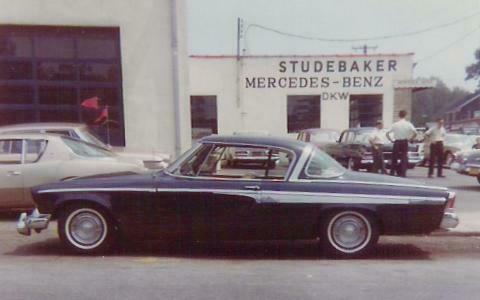 This picture was taken outside of a dual Studebaker Mercedes-Benz dealership on Long Island in 1965.